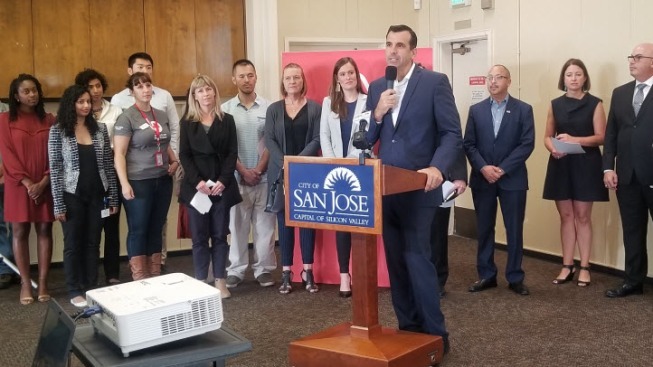 San Jose will be the inaugural city to partner with Airbnb for the "Host Corps" project, offering free housing through local hosts during disasters and emergencies. Damian Trujillo reports. San Jose will be the inaugural city to partner with Airbnb for the "Host Corps" project, offering free housing through local hosts during disasters and emergencies. Aidan O'Leary, a San Jose resident and host who opened up the lower level of her house for evacuees during the floods, said quickly available shelters near an emergency zone can be crucial to people who immediately need to go back to work or take children to school. "I think we need to do all we can to build resilience in our community," O'Leary said, comparing the free shelter to donating food or money. Open Homes, the predecessor to Host Corps, began in the wake of Hurricane Sandy on the East Coast in 2012, and Airbnb has since offered accommodation to 15,000 emergency evacuees in 50 countries, according to Kim Ruby, the company's head of social impact. Mayor Sam Liccardo said the access to room space via Airbnb allows the city to be much more "nimble" during a disaster, as opposed to local hotels or motels that have a fixed capacity or fill up quickly. "I'm grateful to be working with Airbnb as we go together to keep San Jose safe," Liccardo said. Stressing the importance of disaster preparedness, he also advocated for Measure T on the city's Nov. 6 ballot.